What You Need to Know: Good Jake Arrieta showed up once again, falling just one out short of tallying an eighth consecutive quality start, but the righty struck out eight and allowed only a run over 5 ⅔ innings. 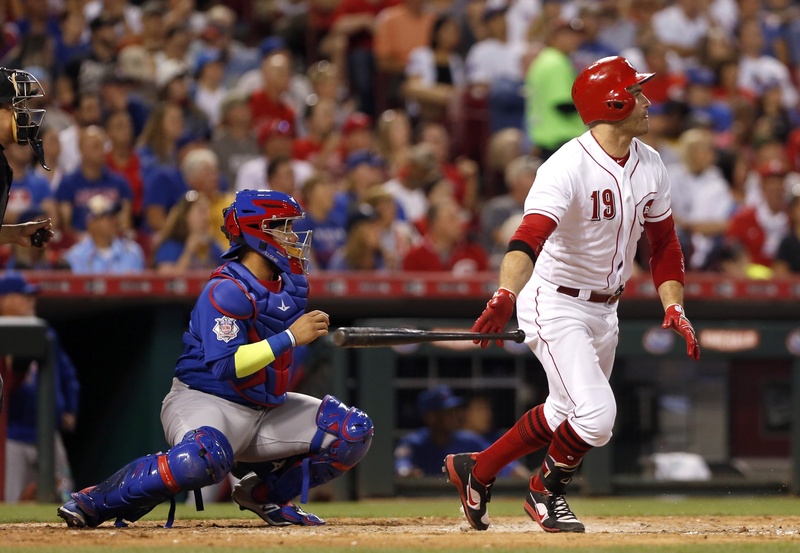 An early solo shot by Ian Happ and a timely Javier Baez single put the Cubs out in front of the Reds, but Pedro Strop botched the eighth inning and cost the Cubs a solid victory. Arrieta is radically altering his release point, partially a function of moving toward the center of the rubber. That move has jerked his release point more toward center, this month closer to 3.25-3.5 feet to the right of center than the 3.5-3.75 foot zone he had been in most of the year. 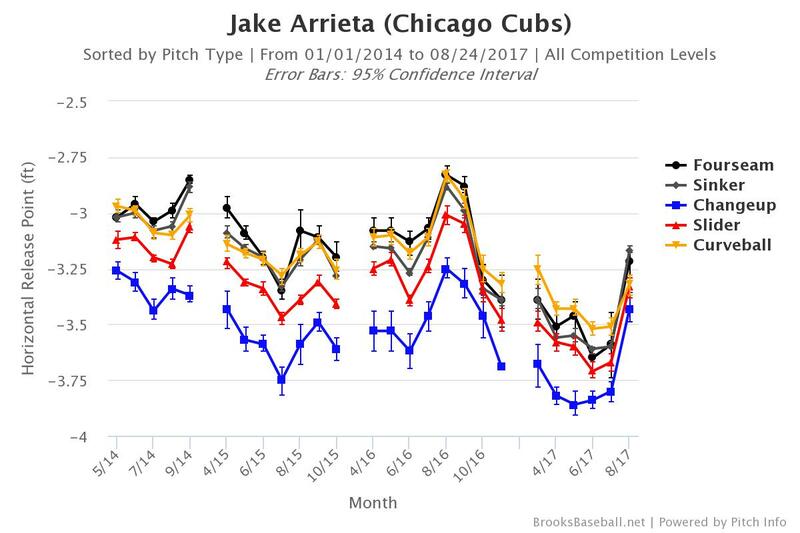 But Arrieta has also dropped his arm, as the second graph shows. 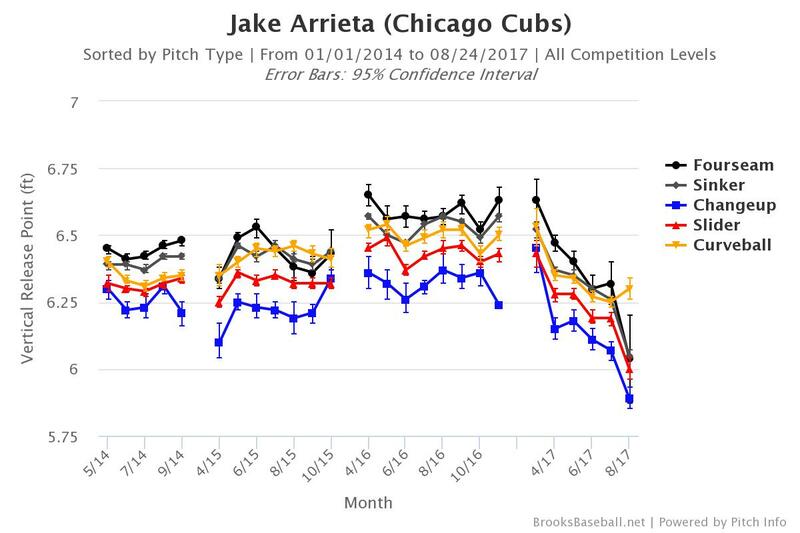 His arm is much lower than it has been at any point in his Cubs career, and it appears to have helped Arrieta get the movement and velocity he needs for his sinker and slider. The sudden drop in arm slot is also slightly concerning, as it could have some unforeseen consequences either in performance or in health. Arrieta’s performance over the next month is vital for both the pitcher and the Cubs, as the former angles for a big free agent contract and the latter looks to secure a playoff spot. Top Play (WPA): With the game tied in the sixth, and Arrieta’s pitch count mounting, the pressure was on the Cubs to take a lead before the bullpen took over. Kris Bryant rapped a bounding grounder just inside the third base line for a one-out double, and a two-out intentional walk to Ian Happ brought up the hot Baez. The shortstop lined a single to left that scored Bryant, with Happ and Baez taking third and second on the throw to home, respectively (+.179). Bottom Play (WPA): The Cubs played very well except for the disastrous eighth inning, in which Strop imploded after getting two quick outs. Adam Duvall singled; Scooter Gennett doubled; Eugenio Suarez found himself on first via intentional walk. Jose Peraza rocked Strop for a deep flyball to left-center, bouncing over the fence for a ground-rule double that plated two and gave Cincinnati the lead (-.506). A wild pitch scored Suarez, and the Cubs failed to score in the top of the ninth. An honorable mention goes to Jon Jay’s caught stealing with one out in the ninth, after he singled to bring up pinch-hitter Alex Avila. Avila is a very poor contact hitter—his 65.7 contact percentage this season is ten points worse than league average—and Jay, with his little speed, had a very low chance of stealing second.